Large-profile line with ~100 m long platforms (6-car trains of F and H stock). 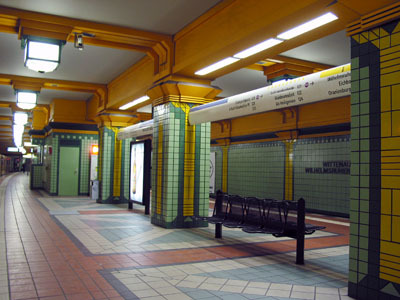 Line U8 operates every 5 minutes during daytime service, although between 09:00 and 12:00, every other train terminates at Osloer Straße. 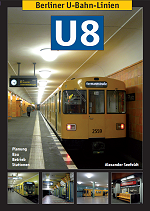 Line U8 is completely underground and comprises the Gesundbrunnen-Neukölln U-Bahn line (Line D) opened in the 1920s. 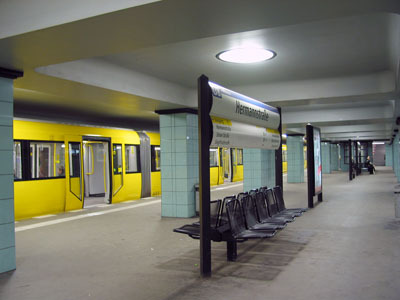 During the times of the city's division, U8 trains ran through East Berlin skipping all stations from Bernauer Straße to Heinrich-Heine-Straße. 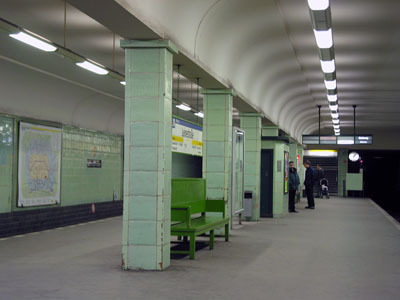 All 'ghost stations' were re-opened in the months following the fall of the Wall in Nov. 1989. 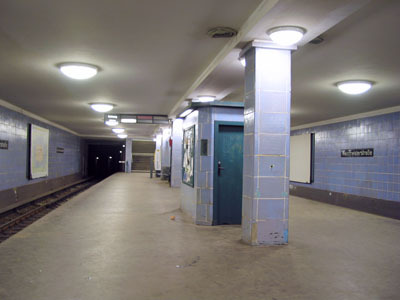 The construction of a northern extension began in the 1970s and eventually reached Wittenau in 1994, although the initially 2-3 station extension to Märkisches Viertel was later shelved due to other priorities after the unification of the city. 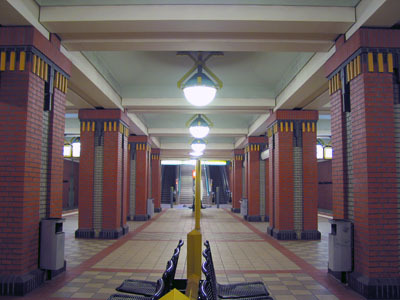 In the south, a 1-station extension was finished to provide interchange with the S-Bahn ring line which had re-opened in 1993. 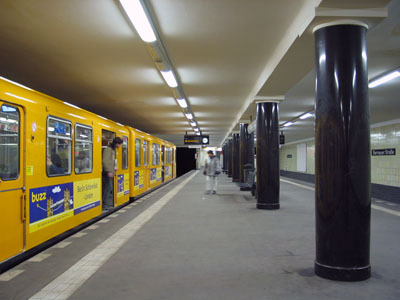 Transfer to the S-Bahn from the eastern end of the platform. U-Bahn station a few hundred metres from the S-Bahn station, which may be relocated in the future. 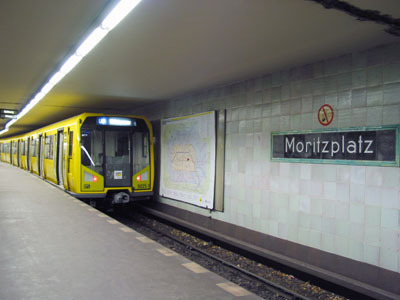 Only station on line U8 with side platforms. Convenient 2-level interchange station, with line U8 on the lower level. 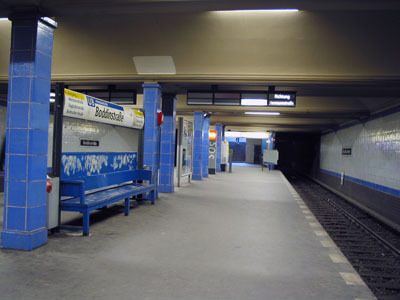 Island platform with direct access to both S-Bahn platforms. 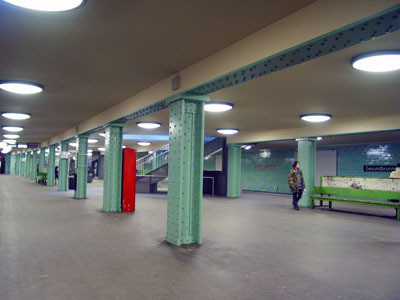 Closed 1961-1990; the U8 station constitutes the western stroke of the H-shaped Alexanderplatz underground station complex. Conveniently located right below the U1 elevated platform. Convenient 2-level interchange station, with line U8 on the upper level. 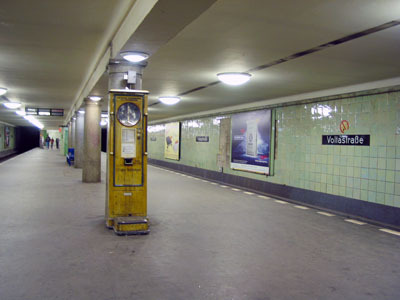 Conveniently located right below the S-Bahn platform.